I made an oval cutting jig from some scrap plywood for a table build that will have an oval top and some abstract shelves with scuplted legs. 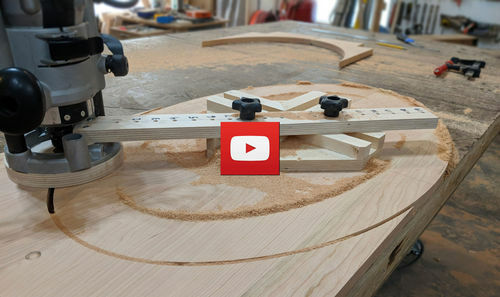 brian your video is excellent,real smooth flow on how you made this jig,thanks for sharing this. Good video, will have to make one myself and try out a few oval projects. Brilliant! And it looks like it operates as smooth as the video. thanks, a little paste wax goes along way. Thanks for sharing. Great video and I’ll give this a shot. Great little gig has many uses. I made one a while ago then made another for my son and gave it as a Christmas gift! Nice work and nice video! Very nice, It will go on my ever expanding favorite list. Thank you. Outstanding! I’ve wanted to play around with ellipses, but didn’t want to shell out the cash for a commercially made jig, so this may be the ticket! Thanks for the video on the build process. It was real helpful and that table is super! !